A grand monument that it is, Palácio do Deão in Quepem was rescued by Ruben and Celia Vasco da Gama from a state of disrepair. As it sits serenely, surrounded by coconut trees and a decorative, layered garden, it has the air of a person who has attained nirvana. 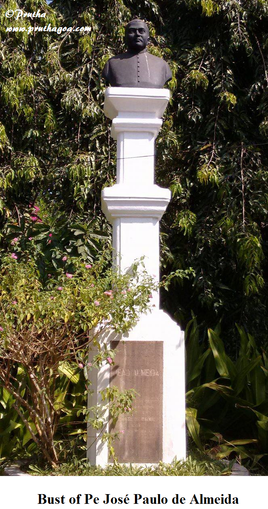 The house provides a notable part of Goa’s history. The story behind this beautiful house is a marvellous testament to the good that men can bring about. Ruben is an engineer by profession, and Celia a microbiologist, but their passion for restoring old houses and monuments (including a fort in North Goa) led them to Palácio do Deão. They now live in the house as the restoration process continues. 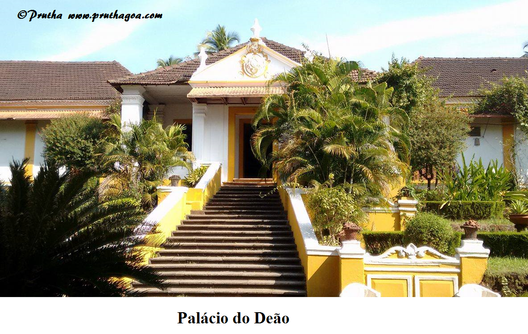 Palácio do Deão was home to Pe José Paulo de Almeida, a Portuguese nobleman who came to Goa in 1779 as part of the retinue of Archbishop Dom Frei de Santa Catarina and served in the capacity of Secretario-Escrivao da Camara Pontificia. He is credited with founding the town of Quepem, which was part of the New Conquest regions. A man of great intelligence, Pe José Paulo rose to prominence and played a vital role in the development of the seminaries at Rachol and Chorao. Nevertheless, his most significant contribution was turning the forested area of Quepem into a place convenient for human habitation. 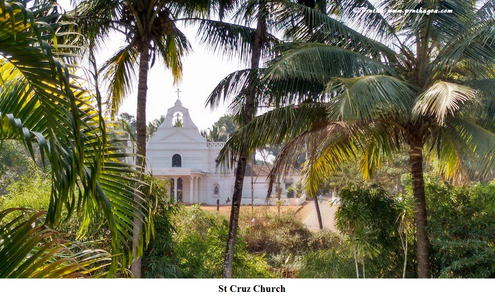 Rice fields, coconut and other fruit trees were grown and the hamlet was provided with a market, a hospital and other amenities as well as the St Cruz Church which faces Palácio do Deão. He built Palácio do Deão in 1787 as a house to retreat to for respite. The tale of the founding of Quepem begins with the building of two columns at the entrance. Pe José Paulo is said to have obtained permission to allow any criminals who came in through those columns into Quepem to work and change their lives for the better. The origin of this story is unknown though the bases of two columns have been found as one enters Quepem. The house has a singular amalgamation of Portuguese and Hindu architecture. As one enters there is a chapel, and statues of saints line the passageway before itthe chapel. The library contains some rare books on Goan history, theology, arts and crafts. There are Indo-Portuguese coins and stamps for numismatics and philately enthusiasts. Games of carom, chess and draughts are also laid out. Visitors are allowed to explore and scrutinise the artefacts after the tour by the hosts. 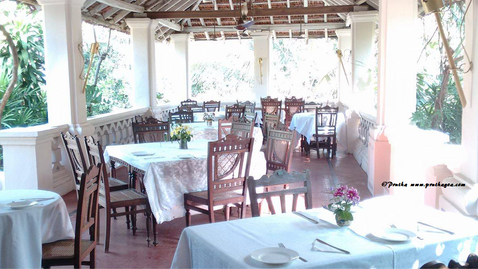 The belvedere at the rear of the house serves as a restaurant to partake of fine Indo-Portuguese cuisine, but the hosts require that visitors inform them of plans to dine at Palácio do Deão before they arrive. The house is bereft of a ballroom since the padre frowned on dancing as a frivolous activity. The verdant garden has an ornamental pond and statues that are striking in their workmanship. ‘If you notice the garden, it is terraced. 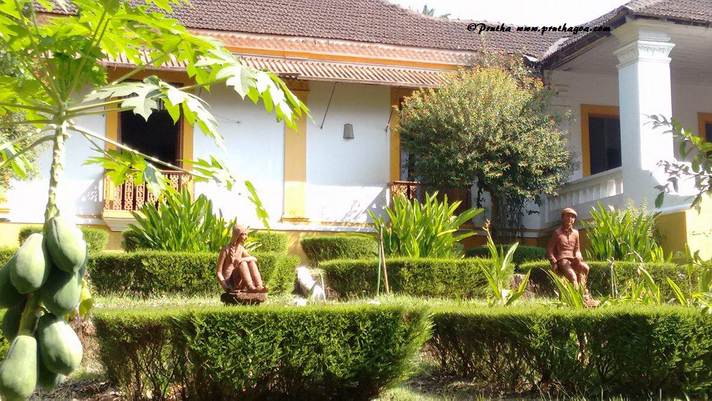 Each terrace is of a different geometrical design and has figurines and fruit baskets. 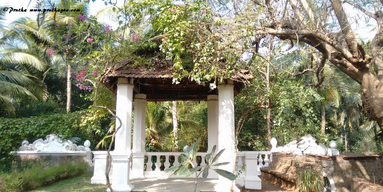 It is Goa’s only existing ornate garden,’ say Ruben. 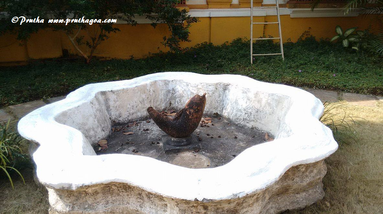 Pe José Paulo’s ardent wish was to preserve the house for posterity. Therefore, in this endeavour, he opened the house to the viceroys of India- Portuguesa. On his death, the house was used by a chaplain. Somewhere around 1989 the house was presented to nuns to care for destitute women, but the maintenance proved to be a gargantuan problem. Visit www.palaciododeao.com for more information. Quepem, Goa, India. 403 705.